We've been planning on adding nitrous controls to our new Pro-M EFI engine management system since the beginning, but despite that, I've had absolutely no intention of adding it to my own car. But after driving our supercharged Mustang with the recently added nitrous kit, my whole attitude toward nitrous has changed. When controlled properly, the results are nothing short of amazing! The progressive nitrous behaves like a supercharger. The delivery of power is smooth, and very impressive... like you've strapped a jet engine to the car! There is nothing quite like it. And when used with a supercharger, the power benefits are twofold. You not only get the power benefit of the nitrous, you also get the added power that comes from cooling the hot intake charge from the supercharger. And, the bottle lasts for a very long time. I figured I'd use up a bottle in a few hours. I've been driving the test car for weeks on the same bottle. Finally! A nitrous system that works as well on the street as it does on the race track! The Pro-M EFI processor will progressively ramp up the flow of nitrous supplied to the engine, allowing for a smooth transition up to whatever amount of nitrous you want to deliver, resulting in an amazing power increase, while minimizing abuse to your drivetrain and your chassis, and extending the life of the nitrous supply. At the same time, the Pro-M EFI processor will ramp down the spark advance, and add extra fuel to richen the mixture to the desired ratio when spraying the nitrous. Below are a couple of examples of the fully programmable nitrous controls. 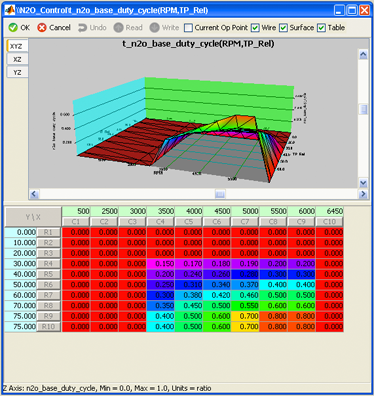 The "N2O Base Duty Cycle" table determines how much nitrous will be delivered based on throttle angle and engine RPM. There is also a "Time Factor" table that will smooth the progression of nitrous even further. These are user programmable of course. 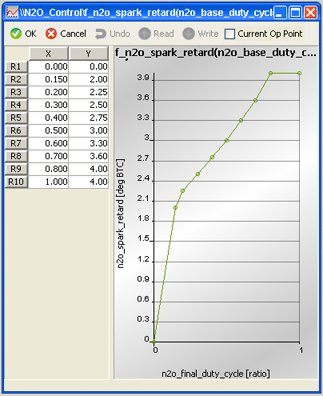 The table shown here is the "N2O spark retard" table. The entries in the left column represent the duty cycle being sent to the nitrous and fuel solenoids. The entries in the right column represent the amount of spark advance that will be removed. All user programmable as well. These are just a few examples of the level of control you have over your nitrous system. The Pro-M EFI nitrous controls are the most versatile and user friendly in the industry.